29/04/2008 · How do you Base Warhammer 40k models? put down a little bit of elmers glue or super glue and set the static grass on top. then flip the model upside down and tap the bottom to shake any extra grass off and to try and make the grass stand up. and thats it. oh yeah. when im putting the gravel on and i miss a spot, i put elmers glue in the hole and mix a little blue or green to try and get a... All this refers to is the simple fact that a static charge that builds up in the bottle allows the strands to fall vertically and stand up in the glue. The benefit of doing this is to allow that extra depth to the grass rather than having a field of blades of grass all laying on their sides. Make a bigger pile of static grass than you think you'd need; you'll be catching the excess grass in the box lid. Let the glue dry for ten to fifteen minutes . Tap the miniature on the side of its base to knock off the pile of static grass, then turn the miniature over and gently blow on the base to make the strands stand up.... What I found was the applicator did work as advertised as the static grass stood up on end to give a realistic effect. 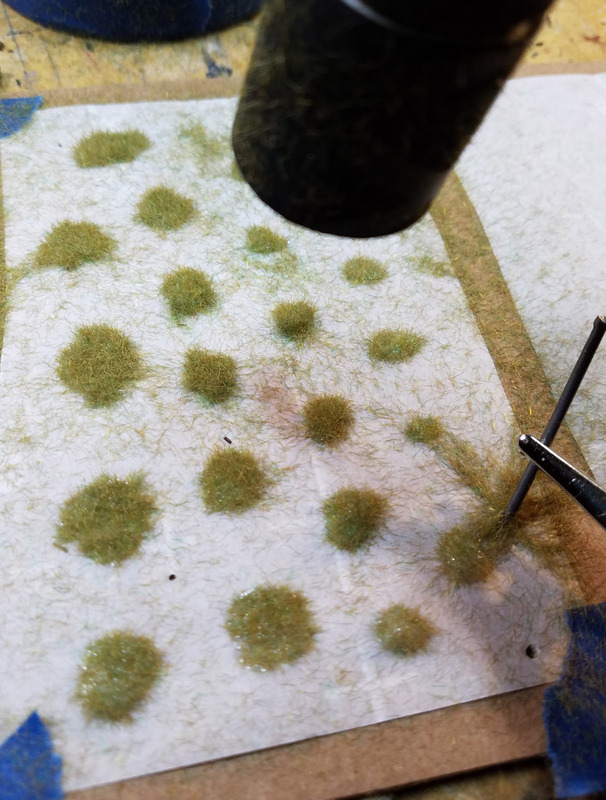 One thing I noticed is that the closer I moved the sifter to the work surface the stronger the static build up and the straighter the static grass would stand. 4/02/2010 · This might be kind of a funny trick, but I've had good results with getting static grass to stand up by using a balloon. Just rub it on your pant leg or shirt to build up static and hover it over your base. Should work.